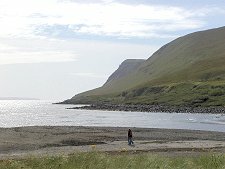 At the southern end of Loch Harport, near Carbost and the Talisker Distillery, is a junction with a minor road heading south. This road leads you across moorland and through forestry before dropping into Glen Brittle. 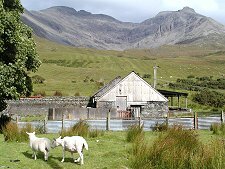 Throughout the few miles from Carbost to Glen Brittle your attention will increasingly be drawn to the ever more striking mass of the Cuillin Hills ahead of you. This ferocious range of mountains, by far the most challenging in Scotland, have a jagged greyness that seems completely out of place in its green island setting. Glen Brittle, and the small settlement of Glenbrittle towards its southern end, feature large in the imagination of anyone interested in the history of climbing in Scotland. Anyone reading the wonderful books of Alastair Borthwick and W.H. Murray about climbing in the first half of the 1900s will feel they already know Glen Brittle. But nothing you read can possibly prepare you for the sheer majesty of the Cuillin. The road down the glen takes the east side of the valley bottom, and views of the Cuillin ridge are slightly restricted both by the grassy lower slopes and the fact that the roadside electricity wires are strategically strung along their wooden poles to impede most photographs of the ridge from below. A waterfall on the river flowing down from Coire a Ghreadaidh is close to Glenbrittle's Youth Hostel, ideally placed as a base for those wanting to climb the ridge. 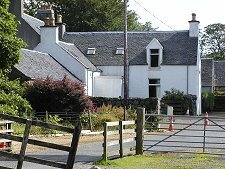 A short distance further you come to Glenbrittle House and its farm, the main settlement in the glen. A recent addition nearby has been a new post for the Skye Mountain Rescue Team. At the southern end of Glen Brittle the River Brittle flows into Loch Brittle. There is an excellent beach here, of a dark sand that reflects well the dark grey of the mountains above. Close by is the Glenbrittle Campsite. This is well kept with pitches widely dispersed across grassy hillocks. 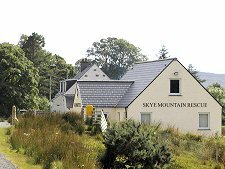 And most come complete with a superb view of the main Cuillin ridge. Above the campsite a path leads over the convex grassy lower slopes of the Cuillin, drawing visitors upwards. There are a number of paths and walks in the area, but the casual visitor should note that the the grey stuff towering above you is strictly for those who know what they are doing and are well equipped. The main ridge of the Cuillin is a place for experienced scramblers and climbers rather than for walkers. 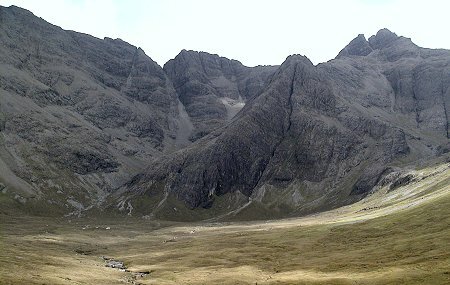 The Cuillin lie at the heart of Skye, and Glen Brittle is one of three main ways of approaching the range. 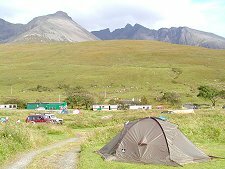 A second lies at Sligachan, to the north of the Cuillin; while the third is from the south near Elgol. View a 3200x600 pixel panorama of the Black Cuillin from the east here.